Given how popular Big Brother Canada 2 was, its not surprising we had to breakup the memorable moments of the season into two posts. In case you’ve missed our memorable moments post from season 1 & 2, here are the links below. Part of this seasons twist involved having 3 additional potential house guests quarantined in a secret room called the “War Room” where they spied on the other house guests and vied for viewers votes to enter the house. Allison White won the votes to enter the house and later in the season she discovered the clues that revealed a secret door to the war room. Once inside the war room she found a Veto Power which she later used and shocked the other house guests by taking Sabrina off the block. After Neda won the Big Brother STAMPede veto in week 6, she was called to the diary room where she discovered a note that instructed her to step out of the diary room and the secret war room would be revealed to her. Neda exited the diary room quickly found the secret door to the war room. Neda was confined to the room where she met Emmett and Jillian for a secret strategy session. Over the course of the following 24 hours the other house guests wondered what had happened to Neda. The live feeds showed Neda on one feed listening to the other house guests here, here and here. Entering the house Kenny decided that part of his strategy would be to keep the fact that he is gay a secret from the house guests. Although we, the viewing audience knew his preference his ability to hid it was surprising as none of the house guests suspected a thing. After 3 weeks inside the house Kenny couldn’t hid it any longer and exposed his secret privately to the person he felt closest to in the house. Nine days later Kenny couldn’t contain his secret any longer from the other house guests and during one of the rare moments of everyone being honest he came out to them all. Everyone was shocked to hear his secret but they were all very accepting and happy the he came out to them. One of the easiest way to mess with other house guests and to break them is when they’re at their weakest. This strategy was not overlooked by Neda as she inflicted more suffering on the weeks havenots by throwing out the only things they were allowed to eat with the slop. Late at night Neda snuck into the pantry and dumped out all the mustard, ketchup and maple syrup. The havenots that week were Kenny, Rachelle and Sarah. They were pissed that someone would mess with the only food they were allowed to eat. It wasn’t until much later in the season when Neda revealed that she was the one that pulled the prank. Jon and Neda were always horsing around and it was funny to watch some of the pranks they would pull on each other. One such prank was when Neda painted red nail polish on tampons and put them in Jon’s bed for him to find. Jon’s reaction in the video below was priceless. The funniest moments to come from all these punishments was when Jon got mad that Heather actually believed her punishment was the worst and when Adel tried to sleep in the kitchen cupboard during his 36 hour no sleep punishment. What was thought to be just another normal day on the Big Brother Canada 2 live feeds turned out to be one of the most annoying days to tune into the live feeds. Each of the house guests were given fake babies that would monitor how well the house guests parented. The photo of Neda caring for her baby summed up the entire mornings pain I and lots of other viewers endured having to listen to non-stop crying from all the babies. After the house guests returned their babies Big Brother announced who was the best parent and who was the worst. Adel was deemed to be the best parent and Jon was the worst parent. Adel and the others got to enjoy a baby shower as a reward for being good parents. As punishment Jon then had to wear a giant baby costume. Even at the very beginning of Big Brother Canada 2 Adel, Kyle and Paul were drawn to one another with a common bond of being the outcasts of the season. They were either goofing around or fighting with each other. Of the three of them Paul was the most destructive by throwing his partners in crime under the bus numerous times which eventually lead to Adel and Kyle blowing up on Paul as seen in the video below. Can we get the clip to where Sabrina reeeeally freaks out at the end and runs down the hall screaming about Adel? I miss that one. 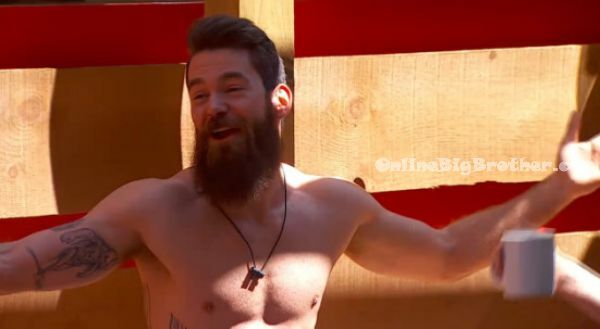 Big Brother Canada 3 – Supersized Sponsorship! Get Ready for MORE TWISTOS TWISTS! MEET The Cast of Big Brother Canada Season 3!